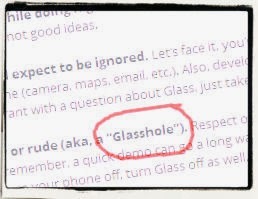 Google surprised a few people by using the word "glasshole" in their own guide to GoogleGlass etiquette, but using the word that your critics use is actually a good idea in the age of search engines. PR professionals used to be told to avoid the negative words used by adversaries, but if you follow that advice today you have a problem: whenever anyone googles that word they find only the websites of your adversaries and you never get a chance to get your own point of view across. Recently an entrepreneur asked why investors look with glazed eyes when he pitches his startup. "I'm developing a B2B solution for integrating various technologies", begins the pitch. Actually my eyes glazed over, too. Not because it is over my head but because it is effectively contentless. Nowhere does he say what they actually do. 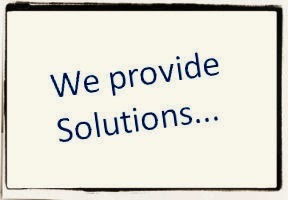 "Solution" is too generic since that should apply to any business -- you are hardly meeting the expectations of your customers if you deliver problems. Sadly this happens far too often. A fairly sizable tech company has a Twitter bio that says "provider of technology solutions that transform the way manufacturers create and service their products". I learned later that the "solutions" they talk about are actually software.